The brand new movie Hellboy, directed by Neil Marshall and starring David Harbour, has a much darker tone than Guillermo del Toro and Ron Perlman's earlier vision, but it's based pretty closely on the Mike Mignola comic books, published by Dark Horse, where the character originated. That means that it features many characters who fans of the comics may recognize, but who could remain obscure to newer fans. For that matter, it also draws on mythology and folklore just like those comics do, so many of the characters are truly ancient. Merlin and King Arthur even show up in this movie, but you almost certainly already know who they are. With that in mind, we wanted to help you identify some of the characters who may be more significant than you'd guess from seeing them on screen. Nimue is a major villain in the Hellboy comics by Mike Mignola and Duncan Fegredo, appearing in the stories The Wild Hunt, The Storm, and The Fury. Together, these stories form the basis for the narrative of the new Hellboy movie, in which she's played by Milla Jovovich. However, she existed as a character long before movies, comic books, or even the printing press were around. In fact, Nimue was usually considered the same character as the Lady of the Lake, who gives King Arthur the magical sword Excalibur. That's not covered in Hellboy, but it makes sense that she might still have done it, since giving Excalibur to Hellboy is a key part of her plan in the present. Nimue, sometimes called Vivian in the legends and the movie, makes several appearance in Sir Thomas Mallory's Le Morte d'Arthur, which collects the Arthurian legends. She also raised the orphaned Sir Lancelot in some stories. Her most insidious pre-Hellboy act, however, was trapping the wizard Merlin under the Earth. Merlin was in love with Nimue, and she said she would return his love only if he taught her all of his magical secrets. He did so, and she used that magic to lure him into a trap and basically bury him alive. That's also not in the Hellboy movie, but considering Merlin is found buried in a secret cave, and still doing Nimue's bidding, it's not exactly unacknowledged either. 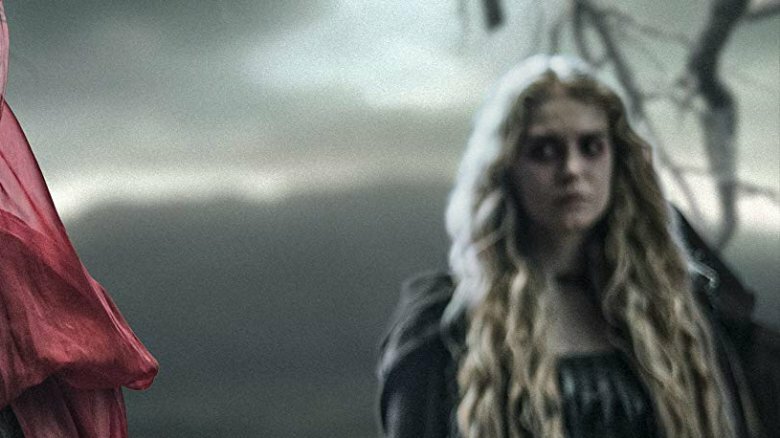 Ganieda, the witch played by Penelope Mitchell who betrays Nimue in the past and is forced to help her in the present, is also a figure in Arthurian legend, although a much more minor one. Ganieda, also known by the delightfully Welsh name Gwenddydd, was the sister of Merlin, according to Geoffrey of Monmouth's 12th-Century text Vita Merlini. She married King Rodarch of Cumbria, but after his death she moved into the woods with her more famous brother. There, she built a house with 70 doors and 70 windows, which enabled Merlin to observe the sky for astrological purposes. They were joined by the British folk hero Taliesin the Bard, who witnessed Merlin overcoming madness by drinking from a magical spring, while Ganieda gained a skill for prophecy greater than even her brother's. Interestingly, many who study these legends see Ganieda as a variation or earlier version of Nimue, which would explain her absence from Sir Thomas Mallory's writing, as she'd already evolved into someone else by then. In the first present-day sequence of the movie, Hellboy goes to Tijuana and fights a vampire luchador in a Mexican wrestling ring. The building where the lucha libre event is happening is full of beautiful vintage posters of masked luchadors. If you don't know anything about lucha, they just look like appropriate set dressing. In fact, these aren't just any luchadors. The most prominently featured is a man in a silver mask. 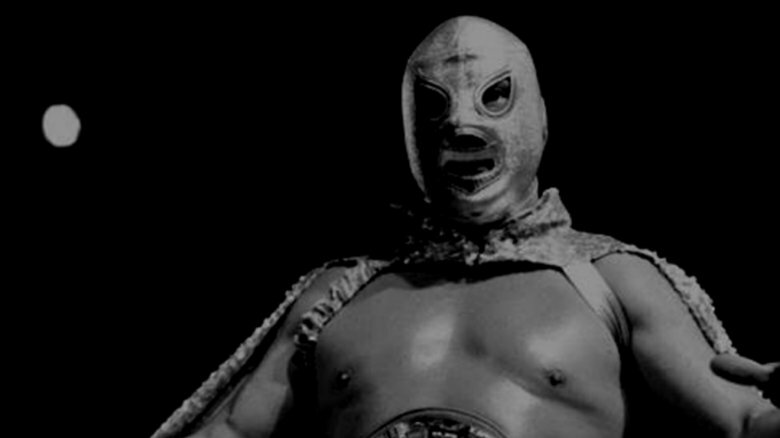 That's El Santo, probably the most famous luchador of all time. There's also a guy in a blue mask in posters that are visible in several shots. That's Blue Demon. What makes this notable is not just that the movie is paying tribute to Mexican wrestling because the scene takes place at a match. It's that El Santo and the Blue Demon were the Hellboys of their day. They also fought monsters, both together and separately, in a whole franchise of Spanish-language action movies that started in the early 1950s and lasted into the '70s. The most famous of these is Santo vs. the Vampire Women, the title of which is pretty self-explanatory. 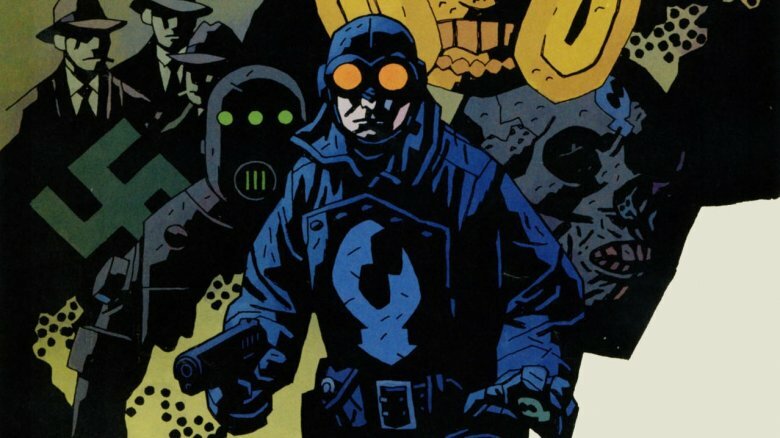 Played by Thomas Hayden Church in the movie, Lobster Johnson (or just "the Lobster") is a character from the Hellboy comics who spun off into stories of his own. He was a vigilante in the 1930s who fought crime at first and then fought Nazis when they became the planet's dominant villains. His real name was William Johnson, and his superhero name was the Lobster, but the two were combined over time and he became best known as Lobster Johnson. As revealed in Hellboy: Conquerer Worm, Lobster died in 1939, in an unsuccessful attempt to halt a Nazi rocket launch. After that, he continued wandering the Earth as a heroic ghost, the form we see him in during the mid-credits scene of Hellboy. If there's a Hellboy sequel, it seems likely that Lobster will play a larger role, considering his comics counterpart has spectrally assisted Hellboy during several adventures. Comments are made throughout Hellboy about the scarred-up face of Ben Daimio (Daniel Dae Kim). 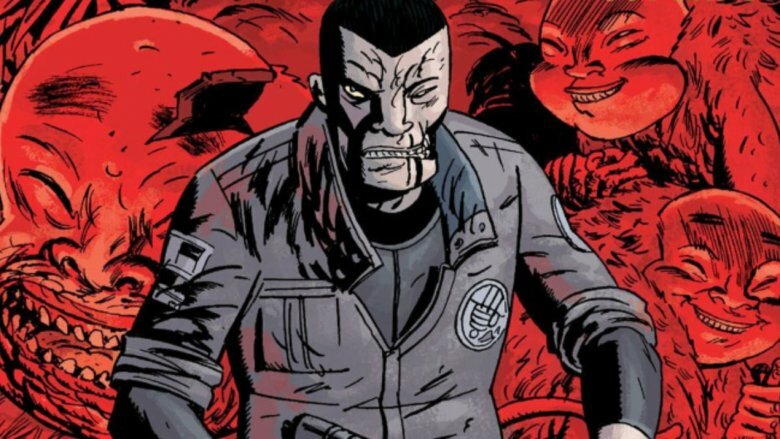 In the comics, however, the scars are much worse: a big chunk of his face is missing, including his lips on the left side of his mouth, so his teeth are always showing. Like his scars, his backstory and the specifics of his supernatural origin are also simplified. In the movie, he's simply a were-jaguar, a man who transforms into a deadly big cat in times of stress. From what we learn in his flashback, he became what he is the same way werewolves usually do — he survived an attack by a were-jaguar, presumably being bitten, and the curse was passed along. In the comics, on the other hand, Daimio is possessed by a demonic Jaguar-spirit that was being worshiped as a god in that jungle where he found it. He doesn't so much turn into a cat and fight alongside his friends, like he does in the movie. He turns into a terrifying monster and attacks his friends, leading to many innocent deaths. In the comic story The Long Death, Daimio sacrifices his life to free himself of the Jaguar-spirit's curse. 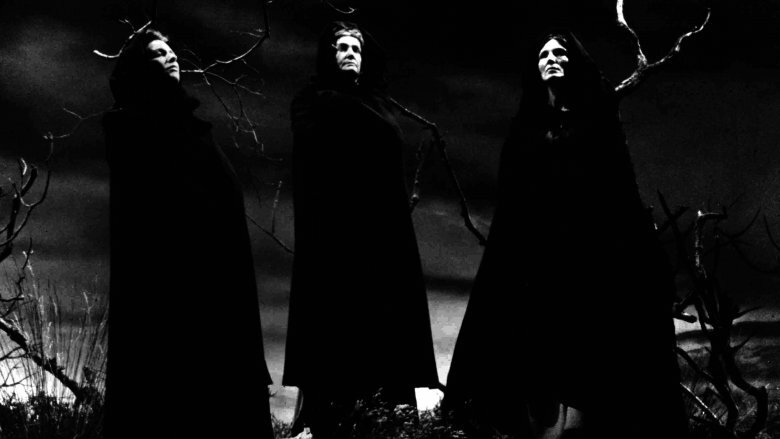 In Hellboy, there are three witches alongside Nimue in the medieval prologue who are credited as "Sisters" and played by Nadya Keranova, Mariya Tepavicharova, and Ana Tabakova. In modern times, another more hideous trio of witches, this time played by Meglena Karalambova, Anna Bankina, and Rut Rafailova, reassemble Nimue's dismembered body. Are they meant to be the same characters? Probably not, since there would be no reason not to use the same actresses, and anyway the witches from the prologue aren't resurrected until later in the movie. On the other hand, there's an argument to be made that all trios of witches are the same characters. Stretching back to the Fates of ancient Greece and the Norns of Northern Europe, trios of wise women, both helpful and terrifying, have been a staple of mythology and fantasy literature. Their most famous appearance is in Shakespeare's Macbeth, where they offer ominous prophecy to the titular protagonist. In more recent times, the three witches played a major role in Neil Gaiman's classic comic book series Sandman, which really emphasized the idea that all versions of this trio have always been the same three, and that those three are at heart one being. The Osiris Club is a secret society based in England who defend the land against giants and other mythical beings. They go after monsters in the highly ritualized Wild Hunt, held on horseback, with the leader of the Hunt wearing an antlered headdress. In Northern European folklore, the Wild Hunt is itself a mystical phenomenon, as originally documented in Jacob Grimm's book on Teutonic Mythology. In myth, the Hunt was usually comprised of ghosts or fairy creatures, with the antlers of the leader often growing out of his head rather than being part of a headdress. 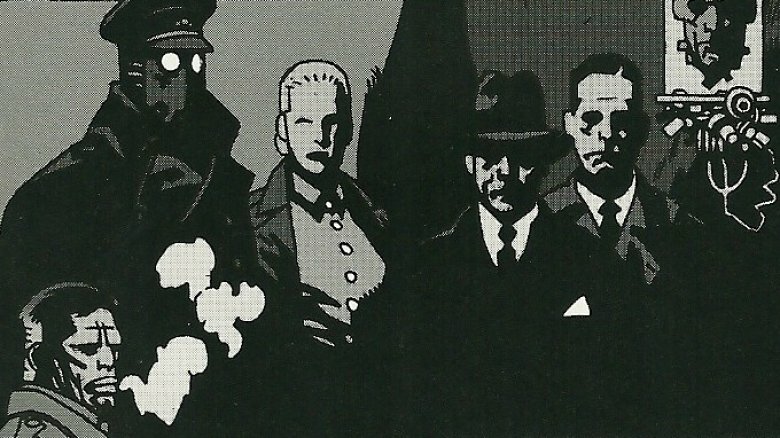 The Osiris Club is much the same in the Hellboy comics, including the inner circle being granted immortality so that they will be around to deal with the apocalypse and its harbinger, who they believe is Hellboy. 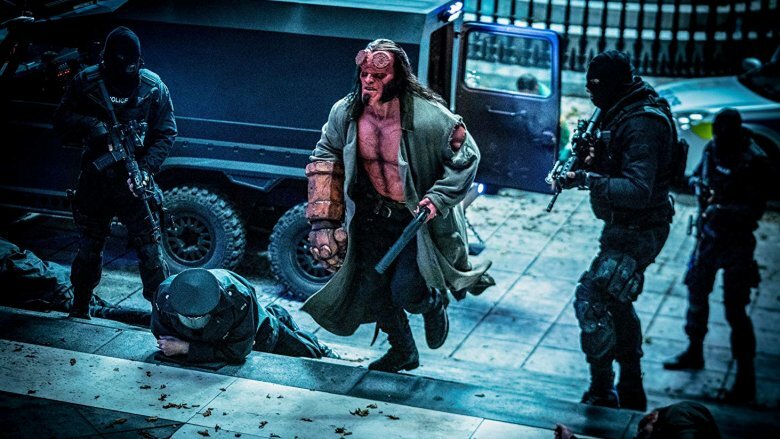 Let's be honest, it's not even that they're wrong to think Hellboy is the Beast of the Apocalypse — he literally is that — they're just refusing to take into account that he's also a pretty nice guy. While the Osiris Club doesn't seem to be based on anyone in particular, secret occult societies were a big thing in Victorian England, and even more so in fantasy stories about that setting. Grigori Rasputin is an important villain in the Hellboy comics, as well as the 2004 Hellboy movie, but before that he was a real man who was born in Russia in 1869. He was a mystic and holy man, and probably a con artist, who purported to have healing and prophetic abilities. Despite coming from a peasant family, he rose to the court of Czar Nicholas II, and became a particular favorite of the Czar's wife Alexandria after seemingly curing their young son of hemophilia. 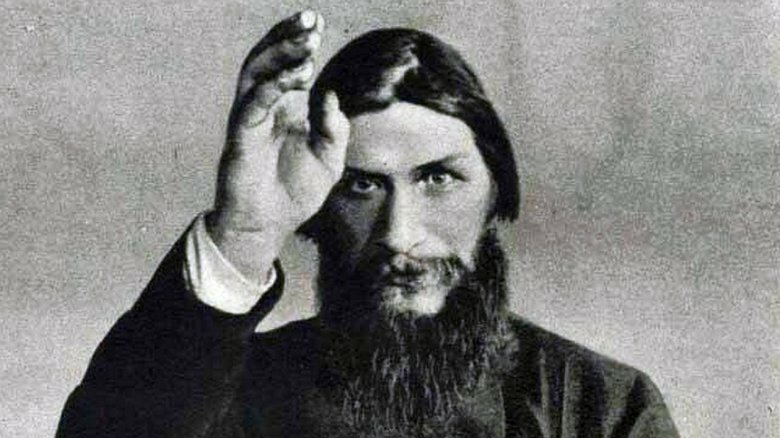 In the years before the Russian Revolution, the royal family's association with the wizard-like Rasputin was a common feature of propaganda against them, as rumors of his unsavory behavior spread across the land. Nevertheless, the Czarina remained loyal to the man she believed had saved her son's life. At the start of World War I, Rasputin prophesied that disaster would strike Russia. He turned out to be correct, and the entire royal family was murdered during the Russian Revolution, but by that point Rasputin himself had already been assassinated by a pro-Czar conspiracy that wanted to end his disastrous effect on the regime's reputation. He proved famously hard to kill, when deadly poison seemed to have no effect and his assassins then had to shoot him many times. In the Hellboy comics, Rasputin was a legit mystic who was resurrected by dark forces after his assassination, and went on to help the Nazis in the ritual that brought Hellboy to Earth. That flashback is his only appearance in the 2019 movie, although in both the comics and the earlier movie, he returns again and continues his villainy in the present day. There's an unseen and apparently undying character who appears with the Baba Yaga in the after-credits scene of the new movie, and it would make a lot of sense if it's Rasputin she's talking to (although there are certainly other characters it might be). Of course, Rasputin had some allies in conducting that ritual for the Nazis. The most recognizable were Klaus Werner von Krupt, Ilsa Haupstein, Karl Kroenen, and Leopold Kurtz. Like Rasputin, they aren't as prominent in the new movie, but they're there if you watch for them. Von Krupt is the one with the 3-D glasses, Haupstein is the blonde woman, and Kroenen always wears a mask. In the 2004 movie, Guillermo del Toro turns Kroenen into a kind of sword-wielding clockwork ninja, but none of that is in the comics, and there's certainly no room for it in the new movie. It's entirely possible that this group of characters was only included as an Easter egg for fans, but it's also possible they'll turn back up for a sequel. Particularly if the after-credits scene really is about Rasputin, it would make sense to see more of them, at least in flashback. In Celtic mythology, the Gruagach was a loosely-defined monster like an ogre, goblin, or giant. That definition suits the boar-faced character from Hellboy, but the comics flesh him out a lot more. He was originally a shape-shifting warrior of the faery folk, but his power was depleted when a human lover screamed after seeing him in a more terrifying form, thus invoking a curse that banished him to a far realm where he was reduced to a shadow of his former self. In the Hellboy story The Corpse, the weakened Gruagach attempts to take the place of a young Alice Monaghan, just like in the movie. 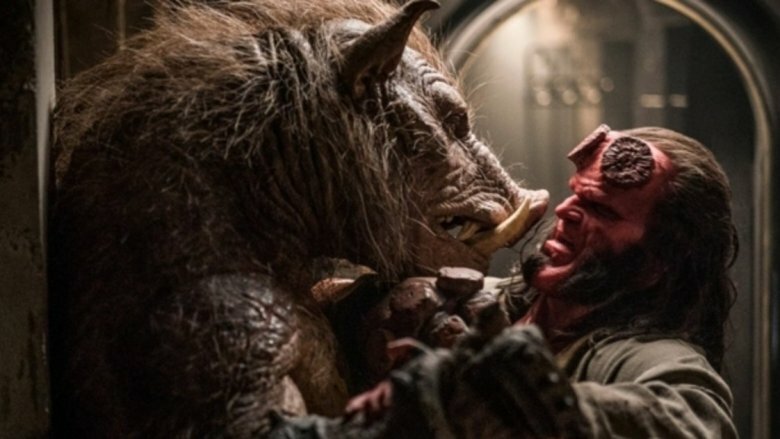 When that fails, Hellboy leaves him trapped in the diminished piglike form of the Fomorian giant Grom, which is the shape he appears in throughout the movie (taking on the giant's true, larger form just for the climax). In the comics, Gruagach commits a lot more mischief along the way, but he does eventually resurrect the Blood Queen Nimue. She's not the one who kills him in that story, because he's been cursed by Merlin not to die until the world ends, so he can see exactly what his actions have brought about. He becomes such a pathetic figure that Hellboy tries to kill him as an act of mercy, but Merlin's curse holds. He's eventually saved by Morgan Le Fay, who takes him to the faraway realm where figures from myth live on. Baba Yaga is perhaps the most terrifying creature in Hellboy. Sure, Nimue may be literally bringing Hell to Earth and ending the world, but she doesn't butcher children to make a bloody, disgusting stew. 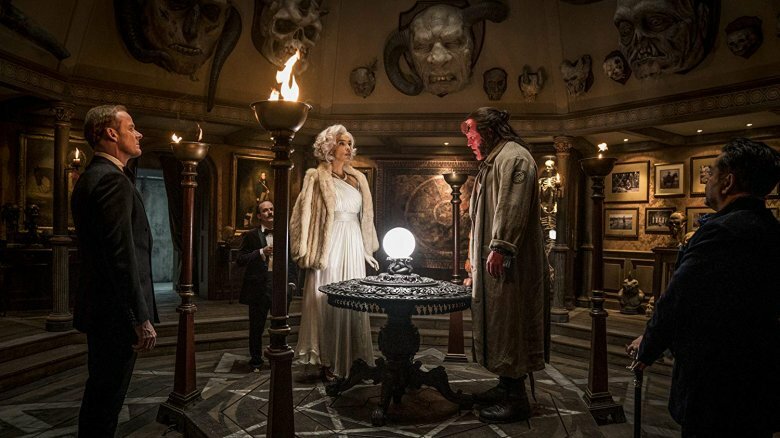 Baba's role in Hellboy is pretty similar to the comics, but both versions draw heavily from the Russian mythology in which she originates. A hideous witch with a long nose who captures and eats children, she lives in a house on chicken legs, which is memorably brought to life in the movie. In fact, the only specifically inaccurate aspect of the film in relation to the mythology is that while her nose is deformed, it's not particularly long. That's most likely because long-nosed witches have become so cliché in the decades since The Wizard of Oz, and Baba Yaga is meant to be terrifying, not look like a Halloween decoration. 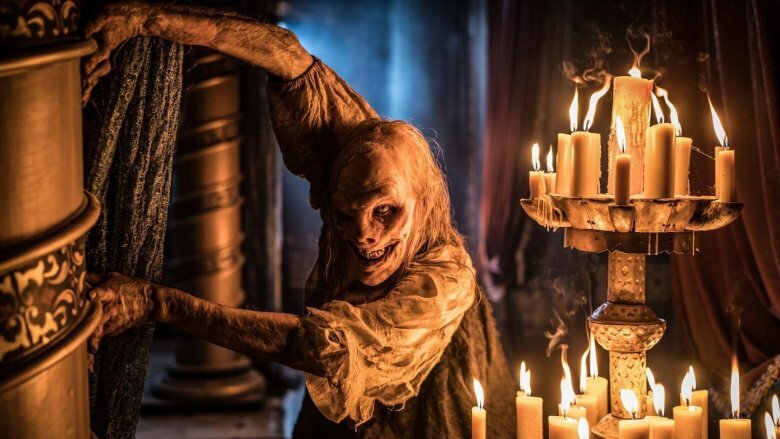 This Baba Yaga meets that goal of being genuinely scary, with the mix of Emma Tate's voice acting and contortionist Troy James' physical performance. Every angle her body takes as she moves just feels wrong, because fundamentally everything about her is wrong. As we've seen on this list, one thing this movie succeeds at is taking characters from both folklore and comics and finding what makes them viscerally terrifying and exciting to watch.